Dear Granddaughter, take my love with you now and into the time that I will never know. It is as much a part of you as breath. Your granddaughter took your breath away the moment you met her. It’s a love brighter than the sun, moon, and stars; It transcends time and space. Show your granddaughter how much she means to you with this precious memento. 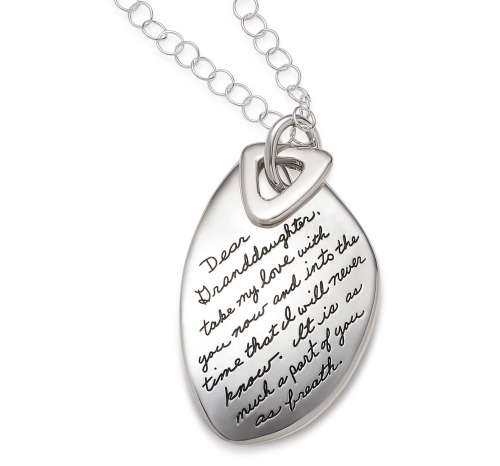 We engrave the sterling silver pendant with meaningful handwriting script then polish every one by hand. A sterling silver loop connects the large sterling medallion with a sterling triangle token to show your eternal connection. This isn’t just a necklace. It’s a beloved keepsake that she will cherish throughout her life.